Generally, when I'm looking for a concert to photograph, I will look at various ticket sites and the local venues' webpages. This show was different. I was looking at my local Craigslist for photo jobs and saw a post from someone representing the band that was looking for photographers and bloggers to come to their shows. I was not familiar with Hank & Cupcake's music before this show and was pleasantly surprised. They put on such a great show. They were energetic and used the whole stage while dancing around and interacting with the audience. Hank and Cupcake performed with Hunx and His Punx at Jack Rabbits in Jacksonville, Florida. 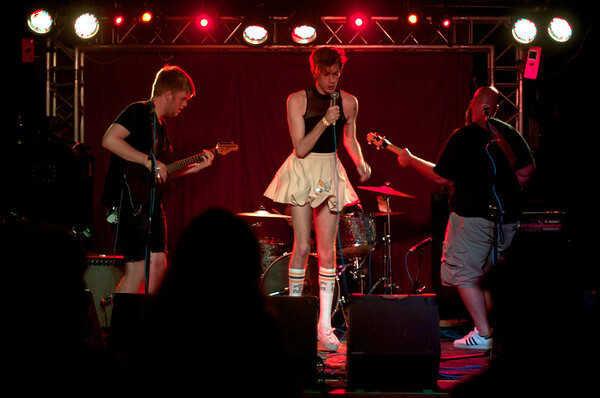 Hank and Cupcake performed with other bands at Jack Rabbits in Jacksonville, Florida. Photography by John Shippee.